Omi - Next front end framework using web components with omio(IE8+) and omip(小程序) fallback in tiny js. omio Omi for old browsers(IE8+ and mobile browsers). omis Server-side rendering(support omio only). omi-chart Simple HTML5 Charts using chart-x tag. md2site Static Site Generator with markdown powered by Omio. omi-mvvm MVVM comes back bravely with mappingjs strong support. omi-html Using htm in omi. omi-30-seconds Useful Omi snippets that you can understand in 30 seconds. omi-canvas Perfect fusion of web components, jsx and canvas. omi-vscode Vscode extension for omi, Install now! omi-transform Omi / css3transform integration. 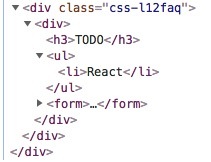 Made css3 transform super easy in your Omi project. omi-finger Support touch and gesture events in your Omi project. omi-touch Smooth scrolling, rotation, pull to refresh and any motion for the web. One framework. Mobile & desktop & mini program. Web Components can also be a data-driven view, UI = fn(data). Scoped CSS's best solution is Shadow DOM, the community churning out frameworks and libraries for Scoped CSS (using JS or JSON writing styles such as Radium, jsxstyle, react-style; binding to webpack using generated unique className filename-classname-hash, such as CSS Modules, Vue), are hack technologies; and Shadow DOM Style is the perfect solution. 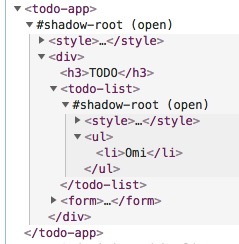 Omi uses Shadow DOM based style isolation and semantic structure. This page demonstrates using Omi with no build tooling. You can also update the view manually then you can choose the best time to update. npx omi-cli init my-app is also supported(npm v5.2.0+). Base Template(v3.3.0+) omi init my-app Basic omi or omio(IE8+) project template. Base Template with snapshoot omi init-snap my-app Basic omi or omio(IE8+) project template with snapshoot prerendering. TypeScript Template(omi-cli v3.3.0+) omi init-ts my-app Basic template with typescript. Mobile Template omi init-weui my-app Mobile web app template with weui and omi-router. omi-mp Template(omi-cli v3.0.13+) omi init-mp my-app Developing web with mini program template. MVVM Template(omi-cli v3.0.22+) omi init-mvvm my-app MVVM template. You can also forget the tedious configuration and use omi-cli directly, no need to configure anything. Unlike global variables, when there are multiple root nodes, multiple stores can be injected, while there is only one global variable. Easy to debug via Omi DevTools Extension [Install from Chrome WebStore], using Omi DevTools you can simply debug and manage your UI without any configuration. Just install and debug. Since Omi uses Web Components and Shadow-DOM, it doesn't need to have another elements panel such as React has. It just adds a panel to the Elements' sidebar and it's powerful as much as React DevTools. Omi 4.0+ works in the latest two versions of all major browsers: Safari 10+, IE 11+, and the evergreen Chrome, Firefox, and Edge. Please contact us for any questions. Also, Add Omi QQ Group.